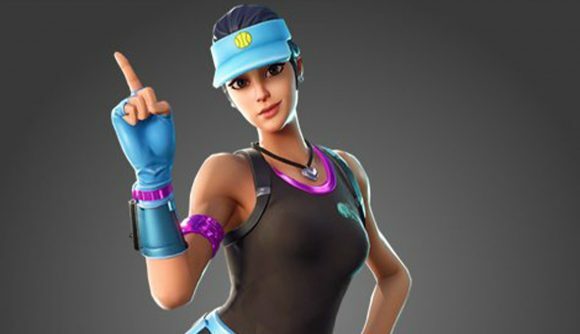 It looks like Volley Girl is the next item to be added to the list of Fortnite skins. Leaks of the new look surfaced today, and while we don’t know for sure when the skin will launch, it’s likely to be very soon. The Australian Open is currently underway, so it’s a great time to get a tennis-themed skin up on the store – even if it doesn’t have the branded appeal of those World Cup or NFL skins. A glimpse of the new skin comes courtesy of prolific leaker Lucas7yoshi on Twitter. Volley Girl comes equipped with appropriately sporty gear, though there’s something about that bracer that certainly doesn’t look tournament-legal. Her associated back bling also leaked – it’s the Used Racket, a half-smashed tennis racket with a ball embedded directly inside. There are typically a pair of gendered counterparts for any new themed skin like this, though we’ve not yet seen any male counterpart to Volley Girl. I do hope that he is similarly named so that I can, like, continue to sneak this terrible slang usage past my editors as something that’s directly relevant to the news. One thing we know for sure is coming to Fortnite will be the new Sneaky Snowman item – look for that to hit the game tomorrow. Check out some Fortnite Creative codes while you wait for all these updates. There are plenty of community creations to keep you occupied in the hours and days to come.